A 22-year-old police officer in California was shot to death early Friday in an "ambush"-style attack while responding to an accident. 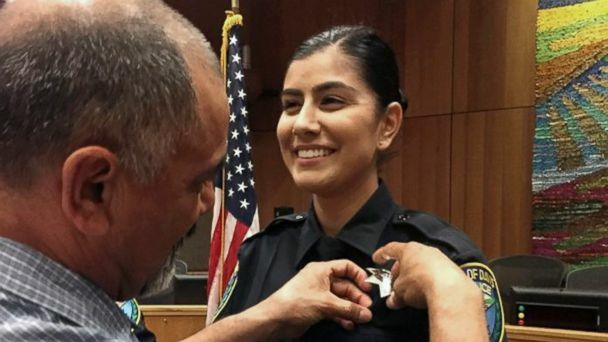 Natalie Corona of the Davis Police Department was arriving at the scene of a three-car collision in downtown Davis when a man on a bicycle pulled up and opened fire on the officer, according to new details of the shooting released late Friday. Corona was struck by one bullet and fell to the ground, upon which the suspect unloaded his entire clip on the downed officer, police said. The suspect then reloaded and started firing wildly, hitting a fire truck multiple times, a house and a bystander in his backpack. The shooter also targeted a firefighter, police said, but he was struck in the boot and not hurt. No one else was injured. "This clearly to us looks like an ambush," Davis Police Chief Darren Pytel said at a press conference Friday night. Corona was rushed to a trauma center in Sacramento, where she died. "She was just an absolute star in the department and someone that pretty much every department member looked to as a close friend, a sister," Pytel said Friday morning. The suspect later was found dead, apparently of a self-inflicted gunshot wound, Davis police confirmed. Police had surrounded the suspect's location, a home on Fifth Street not far from D Street, following the shooting. Police said he entered and exited the building multiple times before eventually moving a sofa in front of the door and shooting himself. Police entered the home with a robot and confirmed he was dead. Corona was shot a few blocks from the University of California, Davis campus. ABC News' Ahmad Hemmingway, Matt Foster and Mark Osborne contributed to this report.